Searching for the right school for a child with an autism spectrum disorder (ASD) opens up a huge and complicated world, and it can be difficult to know where to begin. What should you look out for in a school? What questions should you ask? How do you choose between different educational approaches and programmes? 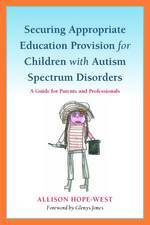 This accessible guide cuts through all of the jargon surrounding special educational needs (SEN) and walks parents and professionals through the entire journey of securing appropriate educational provision for a child with autism spectrum disorder (ASD). The author explains the implications of having, or not having, a diagnosis; how to obtain a Statement of SEN; how to find and secure an appropriate school; and how to work effectively with outside agencies. She provides clear explanations of all of the legal aspects of the process, including SEN law, the SEN Code of Practice and the new guidelines for SEND tribunals. Recognising that mainstream schooling is not the best option in every case, she also shows that independent schools and home-schooling can be viable options in some cases. A multitude of useful resources, websites and other sources of further information are also included. Whether you are the parent or carer of a child with ASD, or a professional working with children with autism, the ideas and information in this book will steer you through the complex maze of issues surrounding how to secure appropriate education provision for children with ASD. Foreword. Introduction. 1. Jasper's Story. 2. Your Special Child. 3. Diagnosis of an Autism Spectrum Disorder. 4. Practical Strategies to Support Your Child with Autism. 5. Types of Educational Provision. 6. Educational Approaches and Programmes. 7. How to Find an Appropriate Specialist School. 8. How to Work Effectively with Outside Agencies. 9. The SEN Code of Practice. 10. The Process of Securing a Statement of SEN. 11. SEN Law and SEND Tribunals. 12. Transition. 13. Brothers and Sisters. 14. Frequently Asked Questions. Glossary. References. Useful Websites and Suggested Further Reading. Index.